“Clothes don’t clean themselves, you know!” I heard my mother’s exasperated voice make that statement more than once growing up. She was always so despondent about it and I could never understand why. I mean, seriously, what is so difficult about gathering laundry, throwing it in the washing machine, and then getting it out again? Then I had children. Laundry is best done daily. That is a plain and simple fact. In a family of six people, if you let a day or two go between loads, you’ll never get on top of it again. Imagine a lumberjack walking a log in a river and you’ll get the picture. One wrong step and the log rolls out from under you. Splash! It starts with gathering the clothes. You’d think that would be the easy part, but children seem to love a good game of “Hide the Socks” or “Stuff the Favorite Sweatshirt in a Corner.” And the good Lord help you if she manages to put her best jeans in the laundry and they aren’t out of the dryer before her date. Every morning, I pull my trusty pop-up laundry basket from under my bed, push out the bottom so that it’s fully extended and make my rounds gathering the load of the day. I start in the kitchen with the damp towels, cloth napkins, and wash cloths from the day before. Nothing smells worse than damp towels in a laundry hamper, so I have kept them out on purpose. I make a quick glance around the livingroom as I pass by just in case a pair of wet socks or soaked jacket was left by the fireplace to dry. The kids’ bedrooms are next on the agenda. A pair of jeans, a piece of a work uniform, or sweaty gym shorts may be hiding from me in there. I grab them up and throw them into my basket. Sheets and bath towels will be gathered another day. There is a laundry hamper in their bathroom. Thankfully most of their clothes are in there. They all share a bathroom and usually throw their clothes in the hamper after they shower. I reach in and pull out the items I’m going to wash that day. Dark cottons, white socks and shirts, blue jeans, or uniforms, get tossed into my basket depending on the day. Last on my list is our hamper. My husband and I have our own bathroom and it has plenty of room for a nice big hamper with partitions for sorting laundry as we change our clothes, that is if my husband thinks of it as he gets ready for bed. I frequently find a white sock in the dark cotton bin and wet towels from a garage project stuffed in with the jeans. Ahh…the life. With my rounds done, my basket full, I make my way out the laundry room. The laundry room for our house seems to have been added on to the back of the detached garage as an afterthought. City water and power didn’t come to our rural area until the 80’s. This house was built as a small cabin in the 60’s. It has been added on to over the years and I can just see the previous owner and his wife’s conversation. A year later, he leads his lovely wife into the upgraded house. The kitchen is small but lovely. The bathrooms are functional and stylish for the era. She searches the house for the laundry room he promised and can’t find it. It’s a bit of a walk but this is the desert and rarely is there ever any bad weather. I doubt that’s what she meant when she said “indoor laundry room” but he’s so proud. How can she be anything but excited? I make that trek across the driveway and around the garage myself several times a day. I start my daily load of laundry early in the morning after my shower. I open the sliding glass door with my laundry basket on my hip and head out. Cottontail bunnies that have found the tufts of grass growing around my drain scatter as I walk by. The laundry room runs across the entire back of my two-car garage. It’s an impressive laundry room. It doubles as a storage room. When you walk in you see the wall to the left of the door covered with built in storage cabinets filled with my holiday decorations, old files, and boxes of unwanted toys that my kids just can bear to part with. Fishing poles and tackle boxes, extra chairs, and an old dresser filled with wrapping paper line the wall to my right. And at the end stand my lovely bright aqua colored front-loading washer and dryer. That set is a story in and of itself. When we moved here the house didn’t come with a washer and dryer, so we drove down into town to the big box hardware store to see what they had. There were boring white and silver sets, but the aqua one was so beautiful. I had to have it. My husband loves me very much, even if I do get a tad over excited about colorful appliances. I drop my loaded basket to the floor in front of the washer and start throwing in the clothes, double checking for any forgotten change, papers, and pens left behind in pockets. I slam the door shut and open the soap drawer at the top. I have my liquid laundry soap container conveniently located on top of the washer right above the soap drawer. All I need to do is open the drawer and push the button to fill the cup the suggested “serving” of soap line inside the drawer. I slide the drawer shut, set the washer dial to “Perm. Press” and the water temperature to “cold” and press the start button. Before I leave, I wait just a minute to be sure I hear the door lock and the water start to run before I head back into the house. My washer takes about one hour to run through its wash cycle, so I have some time to get a few things done before it’s time to come back out. I plant myself down on the couch with my book and a cup of coffee. It’s still early and there are no children up yet to beg for a tasty breakfast or ask me to help them construct a wild project in the back yard. An hour later, the alarm on my phone starts to ring and I shut my book and head back out to the laundry room. The bunnies haven’t come back but a roadrunner flicks his tail and flies up into a Joshua Tree as I pass by. The washer isn’t quite done with its spin cycle, so I take a seat on a folding chair next to the window and watch the desert as a quiet meditation as I wait. My washer’s sweet musical notes startle me when the cycle ends. I must have been deep in thought, but most likely I just dozed off for a moment. 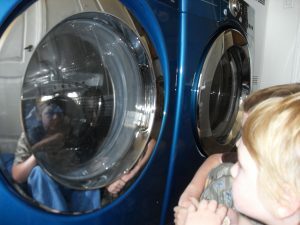 I open the washer door and transfer the wet clothes into the waiting dryer that stands open and waiting. Damn. I missed an ID card that was in my son’s pocket. Luckily it’s hard plastic and unharmed by the washer. I slip into my back pocket and finish putting the load in the dryer. I slam the dryer door shut and spin the selector at the top to a timed dryer cycle, “60 minutes” and “low.” The dryer has so many different settings for every kind of clothing you might have. It looks like the cockpit of an airplane with all its dials, settings, and buttons. They’ve never been used by me. I’m a simple girl! Once I press “go,” I’ve got another hour before these clothes need my attention. I head into the house as I set the timer on my phone again. I always set the timer. If I don’t the laundry will never get done. I’m notorious for losing track of time. My children are constantly on me about how long things take when I’m in control. They’ve heard “It’ll only take a minute. Come on!” and “I’ll be home in an hour.” a thousand times. They know how I operate and usually add on another hour to however long I say it will take. I take the long way around the garage and through the front yard to the front door this time and enter the house through the kitchen. While the laundry is drying, I’ll wash the dishes and listen to a podcast, and then make everyone breakfast. Pancakes sound perfect for a day like this! The alarm goes off on my phone and my youngest follows me out the laundry room to help. We move the basket to the front of the dryer and he pulls all the socks and underwear out into the basket while I pull out the shirts and lay them neatly across the top of dryer so they don’t get wrinkled. Once the dryer is empty, my son pulls out the lint trap and taps the piled up lint into the trash can waiting beside the dryer. He has trouble putting it back in but gets after a bit of work. I lay the shirts across the top of the basket and lift it up to my hip. My son gets the door and we walk back to the house to fold and put away our clean stuff. My sons love to sort out the socks when I bring in a clean load of laundry. I get the shirts off the top of the basket, lay them out on the bed, and get some hangers from the closet. While I hang them up, they dump out the rest of the basket and grab up their own socks, match them up, and take them to their rooms along with the underwear. An empty basket sits on my bed, so I flip it over and collapse it upon itself, drop it to the floor and slide it under my bed. Another morning load of laundry in the books. Let’s get a cookie!